I received notice that this painting and two others were accepted into the Portrait Artists of Arizona 3rd Annual Members Juried Fine Art Portrait Exhibition and Sale. There are some excellent artists in the group, including many professionals. I am honored to be included! 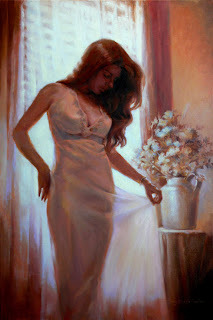 If this painting looks familiar, my earlier blog post of "Sheer Light of Hope" is the pastel study for this piece. 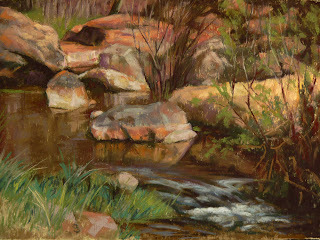 Ironically, it did not make it into the Arizona Pastel Artists Association Spring 2013 Juried Show, however three other pieces did. I am very proud and honored. Yesterday, after taking a walk, I couldn't help but go home, get my gear and go back and set up to capture this view. I spent two hours on site and then came home and finished. 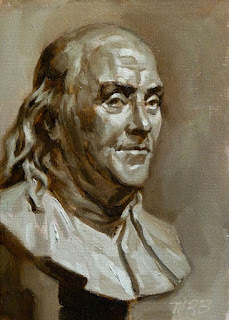 Benjamin Franklin (1705-1790) went to Europe in 1776 to negotiate a treaty of alliance between France and the United States, and remained as the new nation's Minister to France until 1785. Through their fraternal and social activities, he became acquainted with the sculptor Houdon, who recorded in this portrait the statesman's thinning hair, sagging chin, and expression of wisdom and humor. Eight years later, on Franklin's recommendation, Houdon came to the United States to model a sculpture of George Washington. 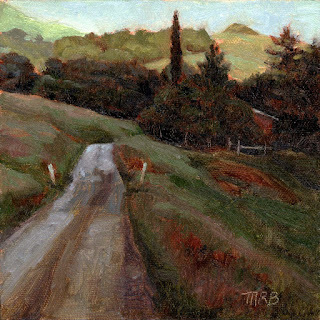 My entry into this week's Daily Paintworks "the Bright Path Challenge".